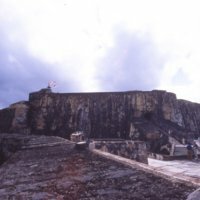 The fort of El Morro, positioned on a promontory overlooking the Bay of San Juan, Puerto Rico, was built as a military garrison in the 16th century and still stands today. Its architecture was intentionally massive and foreboding, meant not only to house the soldiers who manned the fort but also the cannons that would protect the port. This sentry tower, seen along the top left of the building, projects from the fort wall, and offers a view of the surrounding waters. The fort is comprised of stairways, ramps, viewing platforms, parade grounds, storerooms and living quarters. On the lower level of the fort, enlisted men lived. Under the ramp were kitchens for them and other necessary facilities including a blacksmith’s shop for repairing cannons. The initial designs for the fort were drawn up at the behest of the King of Spain, Carlos V, in 1539. But military architecture was frequently upgraded and updated, and one of the most significant rebuilding campaigns and enlargements of El Morro was undertaken between 1760 and 1780. 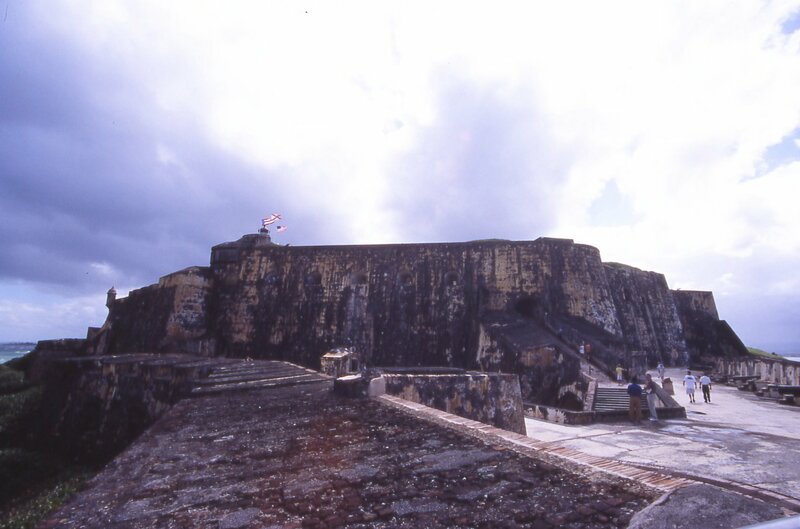 The fort served as such through the colonial period and into the 19th century, when the U. S. took over Puerto Rico. It still functioned as military site in World War II, but today El Morro is a national monument and World Heritage site open to tourists. As a garrison, El Morro was home and living quarters to enlisted men serving the Spanish crown. It was thus both a domestic space and a military outpost, a kind of structure familiar throughout the early modern world, particularly in seaports.